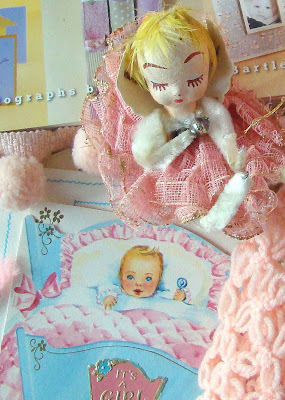 ArtsyMama: It's a baby shower! *~The May Basket swap is CLOSED! !~* If you did not leave me an email in the survey to contact you, you are not in the swap. In other exciting news, there's a baby shower going on right now for Ms. Andrea to celebrate all the wonderful fun that having a little girl involves. She has two sweet little boys and is now expecting a bouncing baby GIRL soon! Hope and Gabrielle are showering Andrea with her gifts as we speak. 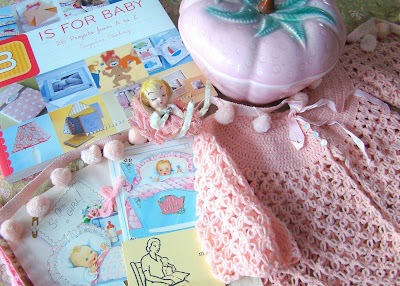 Here is the package of vintage girlie goodness that I gifted her with. 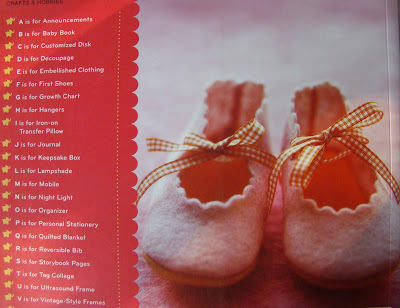 The book is B is for Baby and is full of baby craft projects. I've been wanting to give Andrea this large vintage ceramic strawberry ever since I first acquired it, seemed perfect for her! What a very special thing to be doing. All the baby treasures are so sweet and wonderful! Hi Kari!! Oh my, that pink strawberry is too perfect!!! Love it all, that pom pom trim is calling my name! Just beautiful Kari!! What treasures, she will adore them all! I can't believe you found such a perfect pink strawberry! Congrats to the new parents.. I hope all goes smoothly for them. Great vintage girlie goodness Kari. 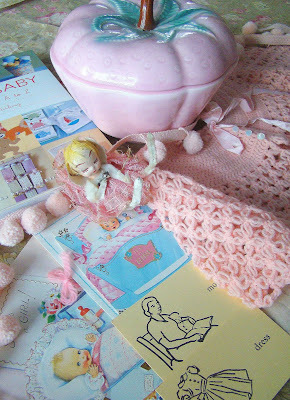 Such precious & sweet things for the new baby girl, Kari! I know she will adore everything! That will be adorable in the baby's room! What a wonderful surprise for Andrea! You guys are so thoughtful. I love the pink strawberry...perfect! What sweet little gifts you gathered for Andrea, she is going to love them! Kari!! The gifts were adorable! I loved the little angel and the book looks wonderfu! I think I need to add it to my wishlist! What a sweet assortment of goodies. You ladies involved are such wonderful kindhearted friends. Andrea and her entire family as super lucky to claim you. You've chosen some really lovely items to share with Andrea. She'll love them! 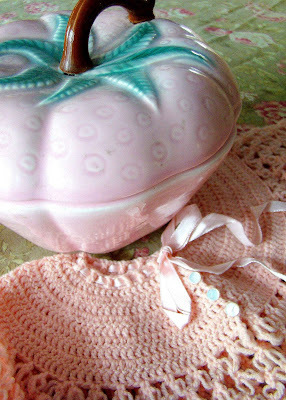 What a lovely assortment of vintage goodies...I love it all, especially the strawberry! Just thought I'd leave a note. I just LOVE your blog! The colors, the creativity, everything! Thanks for sharing you. How lovely, what a special shower that will be! I love the pink strawberry, too sweet! All so very frilly and unique! She LOVED everything, it was so sweet watching her go through the ceramic berry and pulling out all the treats you tucked inside! Thank you for all of the vintage pretties! I just love that pink strawberry (surprise, surprise) and the little cardigan is too cute. Can't wait to hang it in her room! The cards and trims are so sweet and will be put to good use for sure. And as I told you in my email, I have been wanting that book for months! 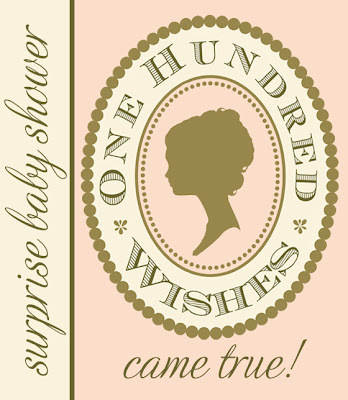 Thank you for being a part of this special surprise shower. I was blown away at the thoughtfulness and generosity you all showered me with.